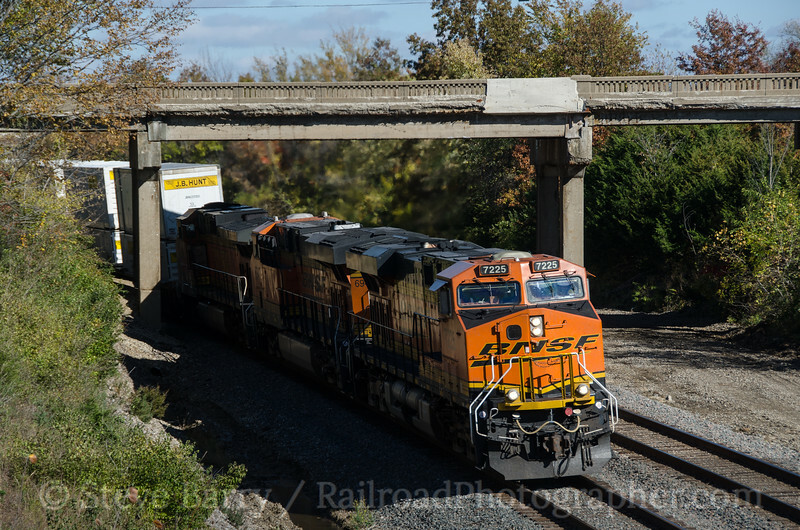 Last month I was invited to be a speaker at a travel writing and photography workshop sponsored by the American Passenger Rail Heritage Foundation and held at the Depot Inn & Suites in La Plata, Mo. As part of the deal, I was offered an Amtrak trip from New York to La Plata with sleeping accommodations each way. 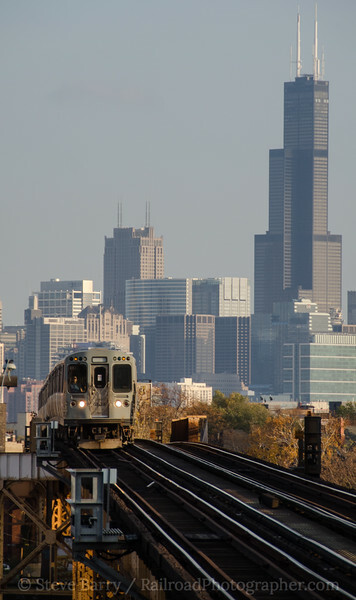 I opted to go out via the Lake Shore Limited from New York to Chicago and return via the Capitol Limited from Chicago to Washington, D.C. (and a Northeast Corridor train from D.C. back to New York). Travel between Chicago and La Plata would be on the Southwest Chief. Because of the train travel, this trip would be unique for me -- I wouldn't have a car, so every photo location had to be accessible via train and foot. On Thursday, October 18, I got a ride from home to Dover, N.J., to begin my train travel via New Jersey Transit's Morris & Essex line to Penn Station in New York. I had sent most of my clothes out to Missouri ahead of me to keep what I was carrying to a minimum so I could do exploring between trains at various stops. 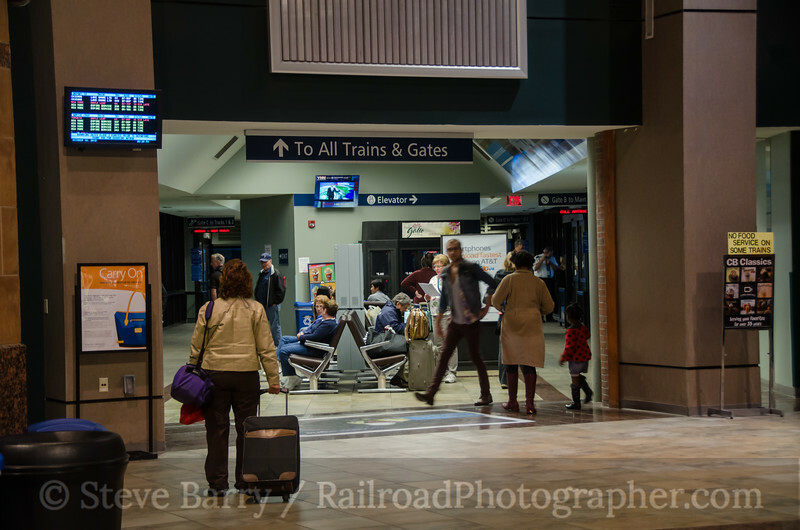 My exploring started right in Penn Station where I found a remnant of old Pennsylvania Station (demolished in 1964) -- a door frame from the old station still remained in the Long Island Rail Road section of the new station. The doorway was located right next to a police kiosk, and I quickly explained to the officer on duty what I was doing -- shooting a doorway is not illegal, but might look a bit strange. "Knock yourself out," the officer laughed. "It's all good." Train time found me settling into a roomette in a Viewliner sleeper. I had a room on the west side of the train for great views of the Hudson River at sunset and enjoyed dinner in the diner in the final glimmer of light. The train paused at the Albany-Rensselaer station for just under an hour as the Boston section of the Lake Shore Limited was added to the train for the trip to Boston, which gave me some time to explore the station there. After departure the attendant made up my bed, and I was delighted to find that the bed was even with the window sill; no awkward propping up was necessary to watch the lights of the towns out the window as sleep approached. Morning was somewhere in Indiana. Arrival in Chicago was in mid-morning and I had about five hours before getting on the Southwest Chief. 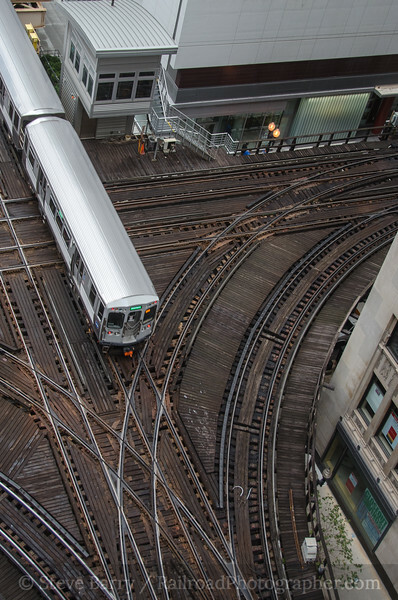 I had seen photos of a pretty neat junction on the Chicago Transit Authority in the Loop that was shootable from a parking deck, and I made my way to the intersection of Canal and Wells and found the parking deck. Sure enough, it looked down on a crossing with interchange tracks in three of the four quadrants of the crossing. Trains were frequent and I tried a variety of angles. With so many geometric lines in the photo, it was a bit difficult to figure out which lines to make parallel to the edges of the photo (and the looking-down angle didn't help matters). The photo at right is heavily cropped and rotated, as I didn't like the looks of the lines in the original. The horizontal photo below is pretty much the way it was shot -- the horizontals were a little easier to frame up. 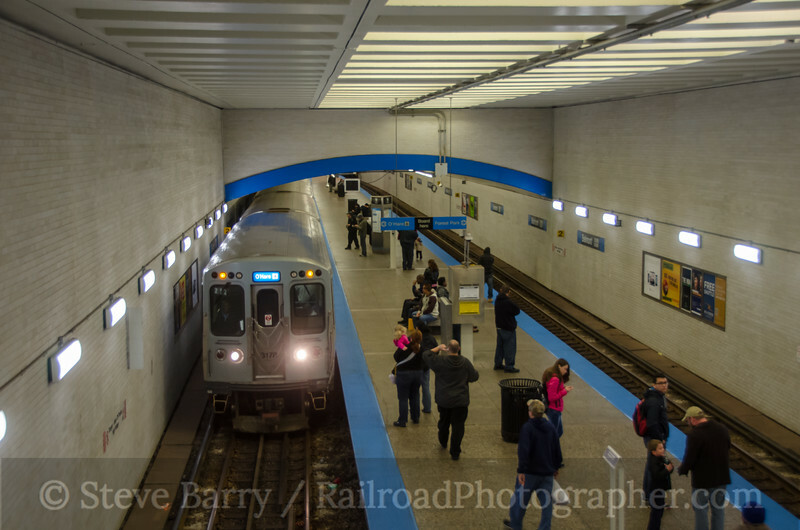 After getting several trains at the Loop, I headed out onto CTA on the Blue Line towards O'Hare Airport. The 2200-series cars are making their last stand on this line before being replaced by newer cars, and while none are used on the front or back of train sets (they are always sandwiched mid-train, making photos difficult) I did make sure to ride a few of the cars. It was cloudy, but I made a few stops for photos, some with the skyline in the background. The line ducked back underground for a couple of stations (the Belmont Station being particularly nice), but when the tracks went above ground again west of Belmont they were in the median of an interstate highway. Not caring for the noise, I turned back to downtown Chicago and explored Union Station before it was time to board the Chief. I had a Superliner roomette on the Chief, but since I'd be detraining at about 9:00 p.m. the bed wasn't required. I enjoyed dinner in the dining car before retiring to my roomette until arrival at La Plata. Once there, a shuttle van met me at the station and took me to the Depot Inn & Suites. On Saturday I enjoyed a railroadiana sale at the Silver Rails Event Center in La Plata, then enjoyed some train watching from the railroad overlook in town. The main line below is former Santa Fe, while the overlook is built on an embankment where the Wabash once crossed the Santa Fe on a bridge. I watched several trains go by (somewhere around ten in an hour -- see the photo at the top of the blog), then did the short hoof back to the Inn. The next few days (Sunday-Tuesday) had the seminars in the morning and usually a short afternoon activity including visits to the Silver Rails Art Gallery and the headquarters of Train Party which, as the name implies, stocks everything you could possibly want for your next train-themed event. Bob and Amy Cox were gracious hosts at both locations. Bob is also the caretaker of La Plata's Amtrak station, and he provided a historical tour of the facility. The weather had deteriorated from Saturday, so I spent most afternoons at the Inn. 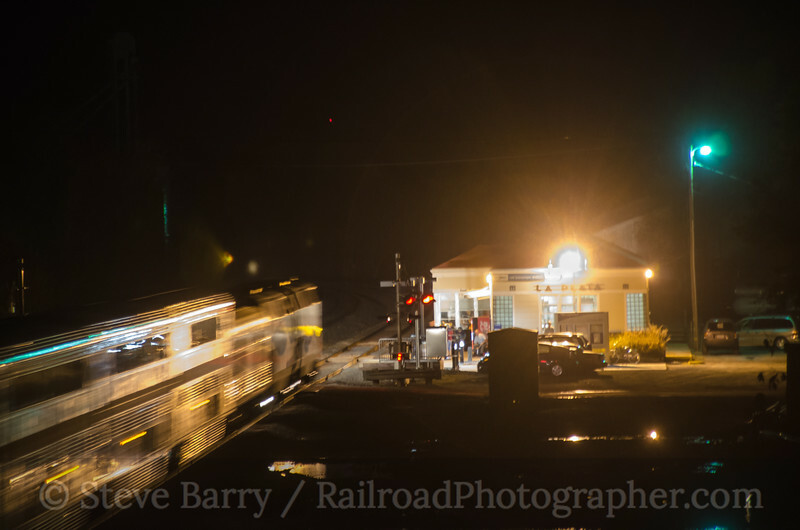 I did get back to the overlook on Tuesday night to shoot the Southwest Chief making its evening stop at the La Plata depot. La Plata is a typical midwest heartland town with the one-story row of businesses flanking a main street and the town square, along with a grain elevator. The highway has long bypassed downtown, so it has a feeling that time stopped a few decades ago. I quickly became attached to the town. All too soon, though, it was time to board Amtrak and head back east. Once again I was in a Superliner roomette for the ride back to Chicago. 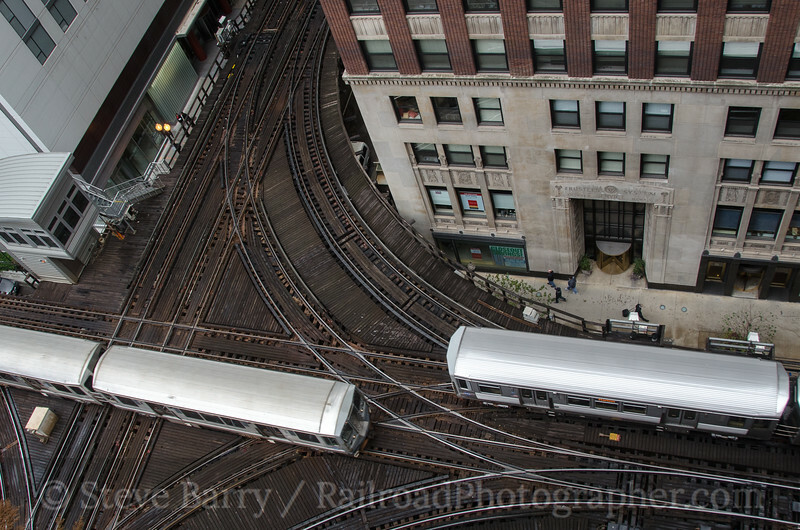 During the week I had some time to evaluate my photos from the CTA junction that I had shot on Friday and decided I would go back there during my Windy City layover and try again if it was cloudy -- there would be too many contrasty shadows to deal with between the buildings if the sun was out. 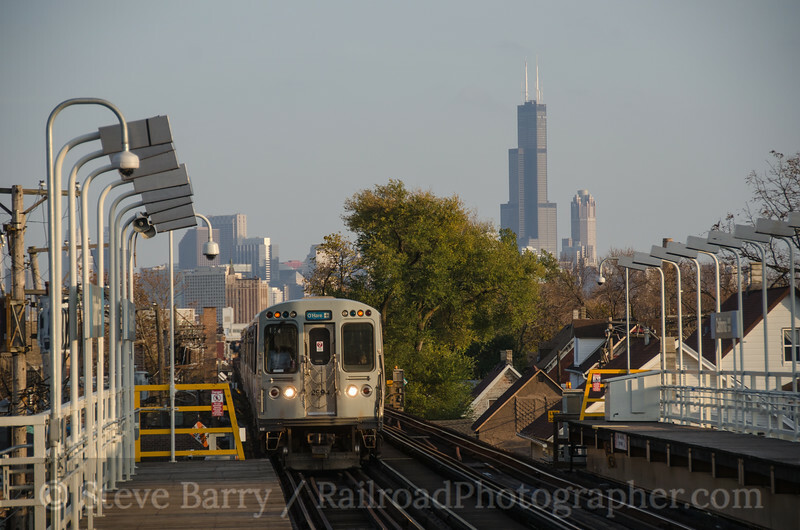 Well, the sun was out, so Plan B was to ride the Blue Line back out to get some of those skyline shots I had seen on Friday. Western Avenue was my first stop, which showed the Sears Tower (I don't care what it's officially called now -- it will always be the Sears Tower) quite nicely. Next up was California, which also presented a nice scene from the end of the platform. My time was growing short to get back to Union Station but I still wanted one more shot at California. I moved myself to the middle of the platform near the steps -- if I saw an inbound train coming I could hustle down the stairs, cross under the tracks and get up to the inbound side. The shot I wanted was actually better from mid-platform that what it was at the end of the platform, so this maneuver was actually beneficial. Another outbound train showed up first, then I hustled over to the inbound side and rode back into downtown. I walked down the platform at Union Station alongside the Capitol Limited, and was soon in a Superliner roomette for the eastbound trip. My last dinner in the diner was held shortly after departure. I quickly discovered I like the Viewliner roomette I had going west more than I like the Superliner roomettes. They aren't laid out quite as nice, and the bed is below the window level by a few inches, requiring bending pillows to keep your eyes at a level to see out while lying down. A pleasant overnight ride was had, and I was enjoying breakfast as the train descended Sand Patch Grade in western Pennsylvania on the former Baltimore & Ohio. Since the miles east of Cumberland, Md., featured numerous tunnels and river crossings, I decided to enjoy the ride to Harpers Ferry from the Sightseer Lounge where I had unobstructed views out both sides of the train. Arriving in Washington, I had over two hours between trains. I spent some time photographing Union Station (the original concourse is under reconstruction and the ill-conceived 1976 addition that now houses a mall is just dark and dreary). 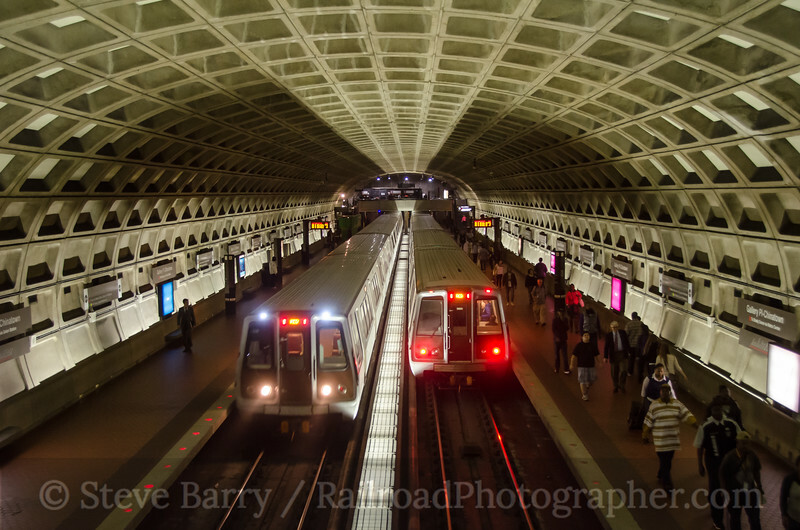 The Metrorail system features some nice stations nearby, so I headed down there for some quick riding and photography. 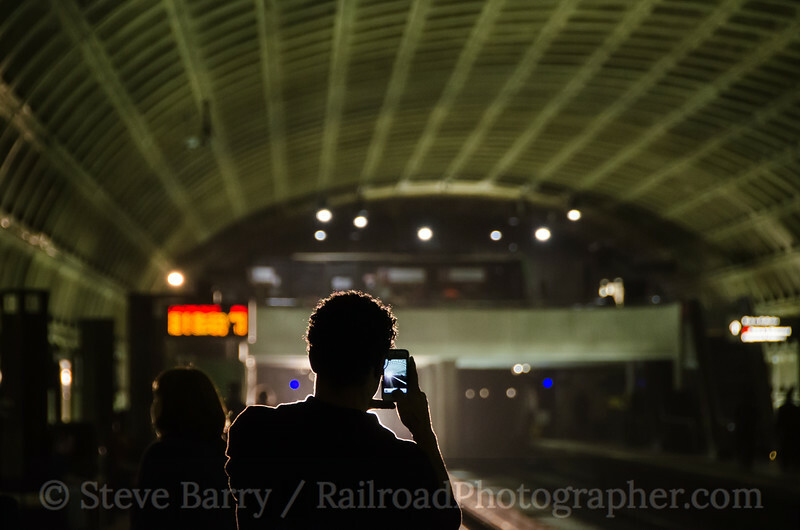 As I was finishing up my shooting, I was going for one more shot from the platform at Gallery Place of a train heading back to Union Station. Just as I was ready to shoot, someone stepped out in front of me with a cell phone to take a picture of the train. The headlights put a rim light around the man, and you can see the train in his cell phone -- I wound up with a much better picture than I could have imagined! The line was long to board the Northeast Corridor train that would take me to New York, but I was near the front and easily found a window seat. The train was pretty crowded by the time we left Baltimore. At New York's Penn Station I had time for a fast food dinner, then boarded a New Jersey Transit train to Mount Olive. My ride was waiting there, ending my Missouri adventure. Thanks to fellow presenters Henry Kisor and Carl Morrison for their hospitality in La Plata. Thanks also to Steve Grande for the train tickets and the lodging at the Depot Inn & Suites. And thanks to the staff at the Inn, Bob and Amy Cox, and the people of La Plata for a memorable stay. Random Ramblings - Here Comes Thomas! Random Ramblings -- Thanks, Cranky!